Hey blog world, it's a new year! So, I think I'm going to kick of the new year right, with a little blog hoppin' fun! The truth is, I've been marinating my New Years resolutions in my noggin for days - and I'm not ready to face it. I'm having a real conundrum about what I'd like to work on this year. Last year's resolutions were a general fail - so this year, I'm considering lowering the bar. But that just sort of feels wrong to me...I digress. I'm proud. Now comes the real trouble: begin my to-do list for the new year. I'm totally daunted. With miscellaneous personal tasks behind me, I have no excuse. FML. 2. I made the most AWESOME cookies yesterday. They're very similar to the Girl Scout Tagalong cookies and SUPER easy. All you do is make a sandwich out of 2 Ritz crackers and peanut butter. Then, dip the sandwich in melted Baker's chocolate and garnish with whatever exterior cuteness you choose. Let harden and voila! I make these for a football-watching party yesterday and they were a hit! Thanks mom for the recipe! This weekend he won his fantasy league Superbowl! Although fantasy football is a bit of a sore subject for me (mostly because it consumes his every thought), I'm really proud of him for winning the thing. There were 16 participants, so it's a semi-big deal that he won the whole shebang. He won some money, which I'm hoping to get a date out of for all my bitching patience over the course of the season. I've grumbled alot about this, but I really am proud. Happy new year! Happy new month! Happy new week! There's alot to be happy about! Um, those cookies look soooooo good...I want to make some stat...so thankyousomuch for sharing the recipe my love!! 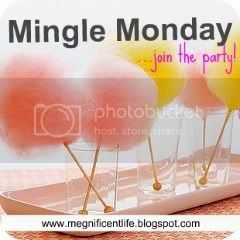 Saying hi from Mingle Monday! I make those peanut butter cookies with my mom every Christmas- they are the BEST! And I am always looking for new nail polish colors-I'll have to try this one!